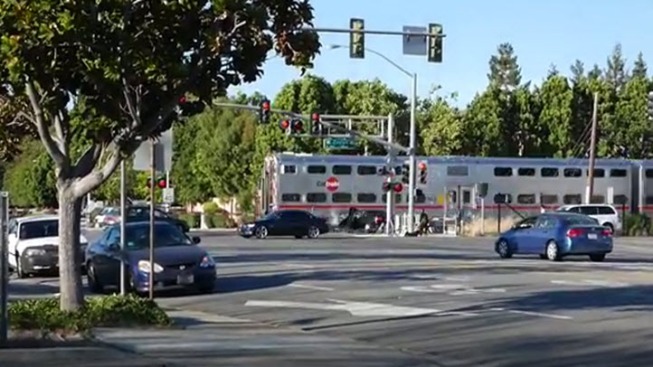 The 20-year-old whose life was saved Monday night when deputies pulled him out of the path of an oncoming Caltrain train was later arrested on suspicion of driving while under the influence, hit-and-run and driving without a license, authorities said Tuesday. After Nelson Gomez was pulled to safety by San Mateo County Sheriff’s deputies, he was soon placed in handcuffs, according to Sunnyvale Dept. of Safety Capt. Jeff Hunter. Gomez was also arrested on suspicion of driving in violation of his probation. Authorities said Gomez was taken to Stanford hospital for evaluation, but it’s unclear if he remains there. Gomez was cited and released, and never booked into jail, police clarified Tuesday afternoon. Hunter said Gomez had hit an unoccupied car and a bike before his car struck the crossing arm of the Caltrain tracks and set off the airbag inside his own car. Sheriff’s deputies Erik Rueppel and Lance Whitted were in the area doing traffic enforcement and noticed what was going on, Hunter said. When they spotted Gomez’s car on the tracks, the deputies jumped into action, and were able to pull the 20-year-old out of his vehicle before the train hit., authorities said. Karin Lizana, who was watching, took video of the encounter, and as of Tuesday, her YouTube post had more than 74,000 views. NBC Bay Area's Kristofer Noceda and Lisa Fernandez contributed to this report.